Heat up the olive oil in a large shallow skillet, and gently cook the onions for about 5 minutes. Add the bell peppers and fennel and continue to cook on medium heat for about 5-6 minutes, or until soft and golden. Add the bay leaves, paprika, turmeric, and cayenne to the vegetables and stir well. Add the rice and stir thoroughly for 2 minutes before adding the wine and saffron. Boil down for a minute, then add the boiling vegetable stock and a pinch of salt. Reduce the heat and simmer very gently for about 20 minutes, or until most of the liquid has been absorbed by the rice. *Do not cover the pan and don’t stir the rice during the cooking. 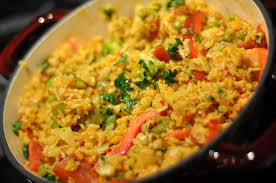 Once the rice is cooked, remove the paella pan from the heat. Taste and add more salt if needed (without stirring the rice and vegetables much). Scatter the tomatoes, artichokes, and beans over the rice and cover the pan tightly with foil. Take off the foil and scatter the olives on top of the paella and sprinkle with parsley. Serve with fresh Avocado & Lime wedges.